This is precisely the wrong way to think about digital goods. 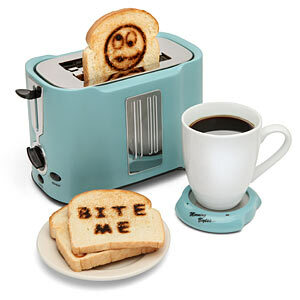 A toaster degrades: the coils wear out, the lever gets jammed, the casing gets stained. You wouldn’t wrap up a toaster and re-gift it or resell it at full price because it’s no longer worth what it was when it was new. As a physical product, it's form and function degrades over time, thereby changing its value. A digital game never degrades. Whether you use it three times or three thousand times, it will always function the same way. There is no difference between downloading a "new" copy of Half Life and using someone else's digital copy. All those 1s and 0s are as pristine as the day it was released. Theoretically, there's no reason why you shouldn't be able to gift Steam games you bought for yourself. A gift code could be generated and sent to a new person. Once the new person activates it, your license to run the copy of the game would be revoked, thus completing the transaction. Steam's explanation regarding why you can't gift old games is cloaked in pro-customer rhetoric, but that's not the real reason the policy exists. Games are expensive to make and distribute, and this policy is Steam's way of trying to find a balance between creator's and customer's rights while still making a profit. Trying to disguise it in terms of the content as opposed to the access and delivery system in which that content resides is dangerous. "Dangerous?" you might say, "Isn't that a little alarmist?" Maybe, but such rhetoric is insidious. Trying to bolt the logic of physical goods onto digital media is what spawns things like the DMCA and SOPA/PIPA. Attempting to run an industry as if it were still the 1950s is what the RIAA and MPAA do. Media companies have a vested interest in maintaining the idea of tangible "things" in the digital age. If you can get people to agree to treat digital media like physical toasters, it's much easier to maintain old, product-based business models. Digital games will only become more important and prevalent as we prepare for a new console generation, and I highly doubt that Sony and Microsoft will let you relinquish your licenses to other players. When it comes to the transition from physical to digital goods, we're already stuck with the toaster model: even though they never lose functional value, we can no longer trade, sell, or gift the games we payed money for. I often worry that it's too late. Everyone (myself included) is deeply invested in this system and it's hard to fight the good fight for unrestricted content when we all have bills to pay and lives to live. I hope that, at the very least, we can remember that games are not toasters. 2. People are willing to pay a lot of money to avoid putting on pants and leaving the house. 3. We have been severely underpaying for games in relation to what it costs to produce them. If $50-60 is still what's necessary for them to be competitive after you've taken most of physical costs out of the equation, maybe that price range has been kept artificially low? I suspect it might be some combination of the three. Breaking news: "Games are games." be necessary to capture consumer attention. I think we'll see the "evergreen" pricing structures that Microsoft and Sony have long employed continue to erode, but I don't think -even in the face of very stiff competition- we'll see any of the big players ever dip their toe into "used" digital sales. Great insight; thanks for the comment! One thing that just occurred to me: "AAA" style games have gotten radically more expensive and all signs point to this trend continuing. I wonder how this will factor into the way digital games are priced? I think we'll see early on in the next generation if some of the major players are willing to buck the standard plateaued pricing structure and their attendant budgets. We've started to see it much more on Steam already with games like Torchlight 2, Hard Reset and others while consoles have remained locked into the $60 retail/$15 downloadable model. I think publishers are scared of being the first to go against the grain of consumer expectations and perhaps rightly so. If you released a $30 experience today it would likely be perceived as "budget" without a relatively robust ad campaign to convince people otherwise. I saw somewhere that the long delayed XCOM shooter might actually release as a $30 downloadable title. 2K dipping the toe? Digital games will never gets old. The demand gets more highly increasing. It can never be like other things as it gets old it doesn't come into use anymore. a meeting place in the form of Cafe Nervous, the Nerve Centro is very much a priming ground for the town's musical talent.